It was on the flight home from NYC that I called Mike on a whim and asked him to book the boys and I a three night stay in a yurt. Meetings at Tory Burch's headquarters, fancy dinners near Union Square and turnaround trips to Connecticut via train are totally up my alley. Just as much as dirt under my fingernails, smoke laden hair and curling up in a damp sleeping bag is. The plane flight home...as many have been recently...was delayed. And after three days of meetings (upwards of 6 a day) and 23 days of consecutive work (not something I make a practice of), my soul was letting me know that it was time for a break. Plus, my eyelashes needed to come up for air after a marathon of mascara smothering and my feet needed reprieve from wedge heels. Sitting on the runway, I texted Mike. It was 4:45 on a Friday. 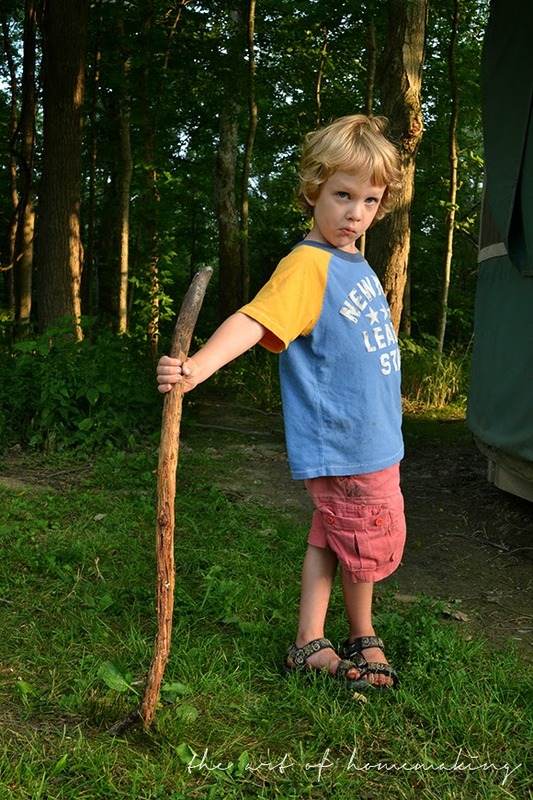 15 minutes left in the week to call a state park to book a camping spot for Monday morning. 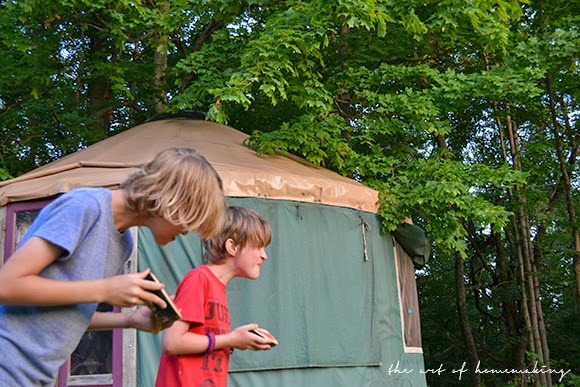 The boys and I (sometimes with Mike, sometimes without~ depending on his work schedule) love to camp. Always in a tent. 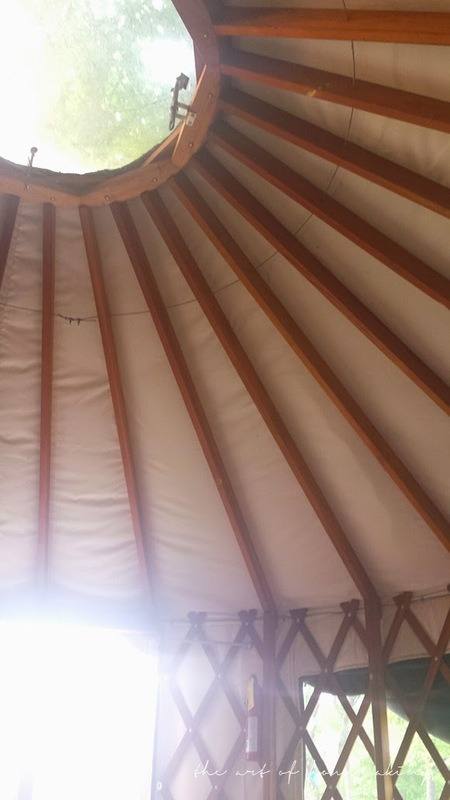 But since my time in Mongolia 14 years ago, I've wanted to stay again in a yurt (pronounced "ger" when in Mongolia.) The state parks here in Ohio have a few for rent...and lucky us, one within an hour's drive. 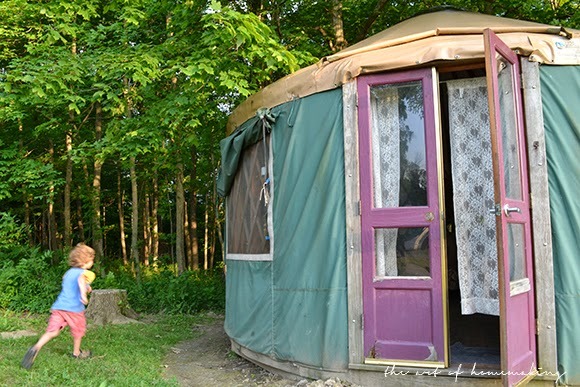 Mr. Johnny-on-the-spot (Mike, that is) booked it before the EOD and by Sunday evening we were all moving our graham crackers and Hershey's, board games and crafts, sweatshirts and bug spray and flashlights and books into our yurt for a few days in the woods. We had dad there for night one. A treat for us all. And then the boys and I settled in for what would become a camping trip of epic proportions. perfectly fine with me. Unplugged few days. Memory...just don't fail me. There was rain. Loads of it. Hence there was Monopoly playing. Loads of that too thanks to the rain pattering on our canvas roof. 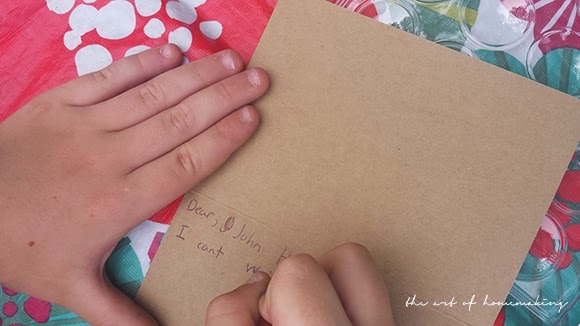 We savored the moments of sun and breeze while making felted animals from wool, painting, hiking and writing letters to friends and family around the country. There was Ezra. 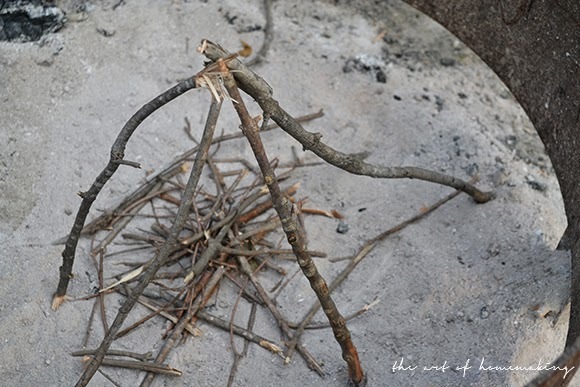 Our amazing fire builder. And there was Canaan. Our always on-site safety expert and order keeper. All three of these boys drove me absolutely batty at times over the course of those three days. And all three made my heart swell with pride at the men they are becoming and the friendship we all share. 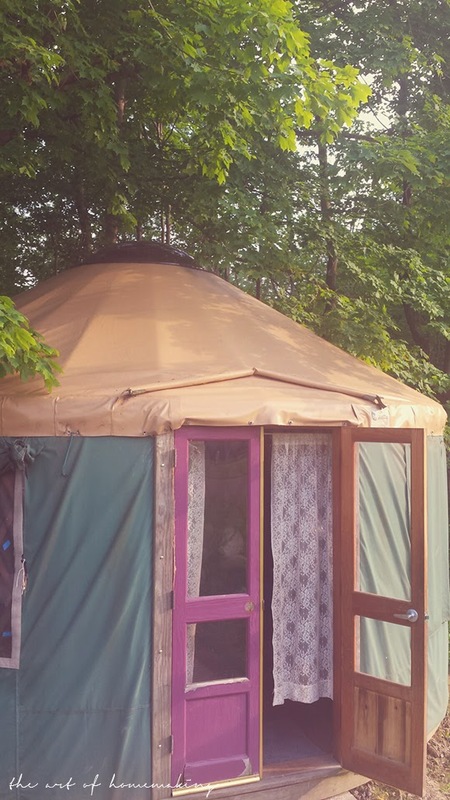 Our little yurt....which Canaan squealed upon arrival with "ITS PERFECT!!!" ...was just what we Smith's needed. Just what this Gemini needed. 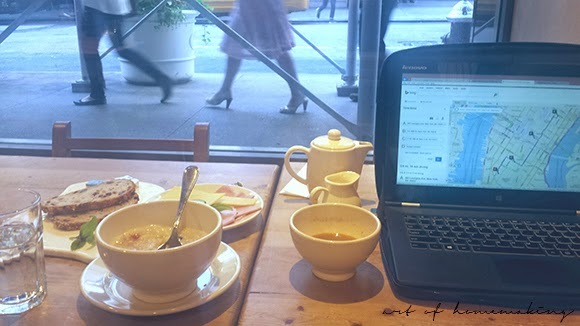 It’s a muggy one in NYC today where I write my first post in months from a little table at Le Pain Quotidien at 44th and 3rd. I feel like I should start this post out with apologies…followed by explanations…followed by recounts and updates on life as I now know it that has ultimately kept me away from moments here on my treasured piece of blogland. But I think I’ll actually forgo the apologies and explanations. Because I think you understand. Life has ebb and flow and seasons and moments in the journey that require us to sometimes do a 180 degree turn in another direction and give our all to something else. That’s where I’ve been. 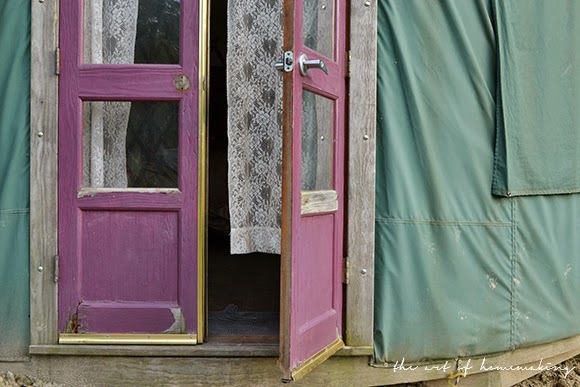 Giving my all to something wonderful, knowing that this little space of mine in blogsphere hasn’t left….its waiting for my return and I’m feeling its tug for reconnection to its simplicity and its grounding more everyday. The Smith Homestead has taken up roots and moved to Ohio. I’m back to the motherland after nearly 15 years away. That little idea of a magazine I had a couple of years ago called CAKE&WHISKEY is growing…thriving! I get giddy thinking about it and humbled by it. Its mission is something that at its very core impacts lives and moves people to a place of authenticity and connectivity to others and themselves in a world of disconnect and falsity. Canaan is now 11. Ezra is 8. Otto is 4. They are more handsome everyday. Never has another child made me laugh more than Otto. I don’t want him to grow up. Seriously. Its so tough watching that happen. I think he should be cloned as he is the most perfectly maddening and irresistible child imaginable. Our relationship with Canaan is making that subtle (and sometimes not-so-subtle) transition from simply ‘child who follows the rules’ to ‘independent thinker who has a valuable opinion that we should take into account’. I actually love this stage much more than I thought I would. 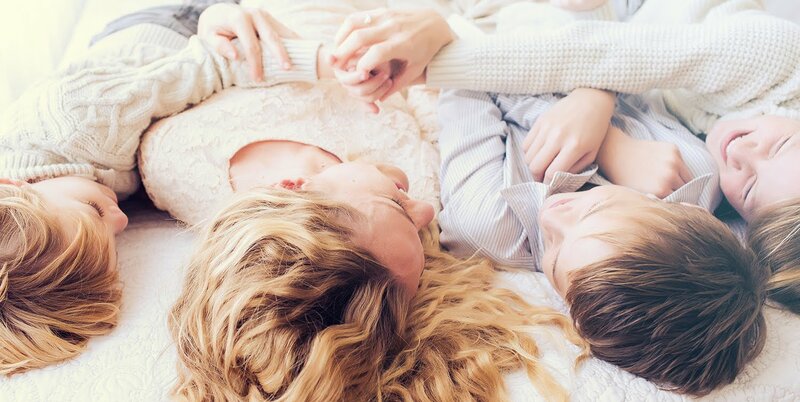 It’s rewarding as a parent to give him more freedom, watch him both flourish and stumble and recover and still rely on the anchor and safety and unconditional love of home. Mike and I celebrated our 15 year anniversary in January. And to keep it all brief but honest…over the past 2 years, Mike and I discovered the depths of marital un-bliss (that hyphenated word is the biggest understatement of this blogs life, for the record). We hear this isn’t uncommon at this stage in the journey…but oh, my. That’s the stuff that’ll make or break you as a person and a family. And thankfully, it did end up making us and continues to makes us better than that initial marital bliss of the early years. So….if you are wading through the thick of it. I’ve been there. Drop me a line. We can chat it out over a shared slice of cake across the table or across the miles. We have bought a 1920’s home in a small sleepy town in Ohio. And its becoming a bit more than we bargained for. 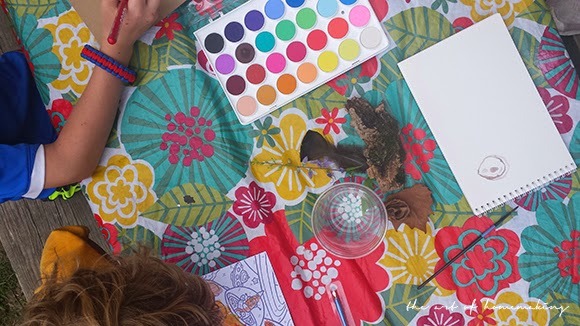 So likely, as I dive back into the land of Art of Homemaking here and there, you’ll get a glimpse into the happenings at our own version of This Old House. On the cooking front...when not in NYC or DC you'll find my nose in a cookbook or whipping up something in our makeshift summer kitchen. My true kitchen is torn down to the studs, so cooking or baking nowadays usually involves a griddle or grill. And I have a seriously uh-ma-zing recipe to share soon…maybe I’ll tackle that this week. Hold me to it! I haven’t sewn in a few (many few) months. But there’s some crafting action about to start up again…my fingertips are missing needle pricks. We spend loads of time outdoors right now. Tennis, hiking, picnicking, kayaking, frolicking on lakefronts and exploring our new town. And I do travel away from home more… NYC mostly. And although four years ago I couldn’t have dreamed up a scenario in which I was sitting, having coffee and oats by Grand Central Terminal alone after 3 grueling days of meetings, it really IS dreamy to be here in this moment. Yes, I miss those kiddos desperately and Mike even more so. Choosing whether to venture from the hotel for dinner at 9pm or just sleep because rest seems more necessary than meeting the calorie consumption I missed by only eating a beet and arugula salad at a lunch meeting… that feels a far cry from sewing marathons at the kitchen table with a pie baking in the oven and the kids playing Uno in the next room over. But in reality, I do still get those times. Just less frequent than before. But that’s not a bad thing. Pie everyday isn’t so good for the blood sugar levels, anyhow. My phone goes off on the weekends (I’m not ignoring your texts, friends and family!) and I keep an office away from home now so the Smith Homestead has once again become simply, home. Any entrepreneur knows the demands of time and focus that creating something requires in the early stages. I can see how easy it would be to slip into that pattern long term…I’ve been tempted to dip my toe into that high productivity, all-else-takes-a-backseat world. But I said 'no' to the temptation. And I'm so proud of myself for giving myself permission to do that. Today I’ll head home after a glorious week doing the work I love. 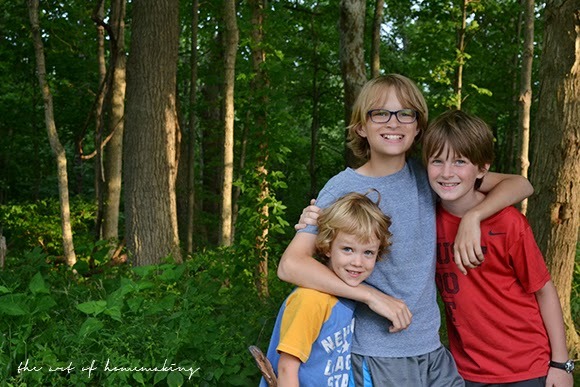 Next week spend some time camping with those three amazing boys.